Bellstone was appointed as Australian distributors of Welsh Slate in 1991 and has been ever since. Architects and "slaters" (slate fixers) have enormous respect and admiration for Penrhyn slate – its durability is legendary. It is also a stately, striking and imposing product that adds style, beauty and a sense of grandeur to a building. We can assist with delivery of Welsh Slate to all states of Australia and are happy to help with project quotes on both supply and fixing to the best of our ability. Welsh slate is no stranger to Australia, its first recorded use here was at the Rocks in Sydney around 1829. Slate from the Penrhyn and other Welsh quarries came to Australia as ballast on trading vessels that unloaded grain and wool cargoes in England during the colonial years. Slate from the Penrhyn quarry in Wales is a magnificent product derived from the famed Cambrian period that was formed 590 millions years ago. In Europe, Welsh Penrhyn slate lasts 200+ years on roofs. In Australia under extraordinary heat loads, slate fixed to the roofs of houses built in the mid 1800s are still performing well as you can see from the historical Lilianfels, Katoomba home at right. Often, the supporting battens and nails fail long before the slate. Welsh Slate are so confident in the performance of Penrhyn slate they offer a written, project specific, 100 year guarantee on their product - subject to information being supplied and certain conditions being fulfilled e.g. the slate being fixed in a way that is consistent with British Standards. Welsh slate came to Australian shores in the early 1800s and its link with our heritage is profound. Early dwellings often had bark roofs and sometimes shingles made from red cedar or casuarina - but they were not perfect waterproofing materials. Slate arriving here as ballast was cheap, tough, and remarkably durable – but best of all, totally impermeable to water! Historical references indicate that Welsh slate was first used in Australia by Captain Piper in the Rocks area of Sydney as early as 1829. It was used on a number of buildings in the 1830s including Elizabeth House and Camden Park. Images of fine heritage buildings featuring Welsh slate roofs may be seen in the project images above. Since then it was used widely on civic buildings and has shown remarkable resilience under Australian heat loads and more recently polluted air. There are many examples of Welsh slate maintaining excellent structural integrity after 150 years. Battens and nails often fail years before the slate. Lilianfels homestead at Echo Point, Katoomba was built in 1889 as a weekend retreat by NSW Governor, Frederick Darley. It is now used as "Darley's" Restaurant at the internationally renowned Lilianfels Hotel. The stunning roof is made from Welsh Penrhyn slate. Clean mountain air, good roof ventilation and copper nails to fasten the slate are factors that contribute to roof longevity; a life span of 200 years is quite achievable. The Coast Hospital featuring its welsh slate roof commenced operations in 1881 and was renamed Prince Henry in 1934. The photo shows one of the old wards. 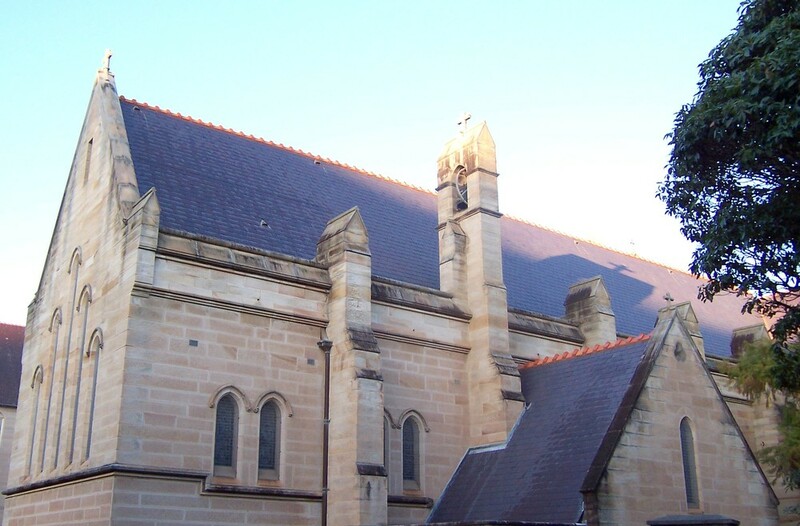 In 1998 it was dedicated as a Centre of Excellence for Aged Care and Rehabilitation and the former hospital buildings underwent a program of restoration involving re-roofing all the buildings with new Penrhyn slate. The re-roofing program commenced in 2004; many of the slates on the southern side of the original building were in good condition despite their age. However, trapped moisture under the northern side of the roof caused battens to rot and the slate to decay on the underside. It is evidence that good ventilation is vital to achieve slate longevity. 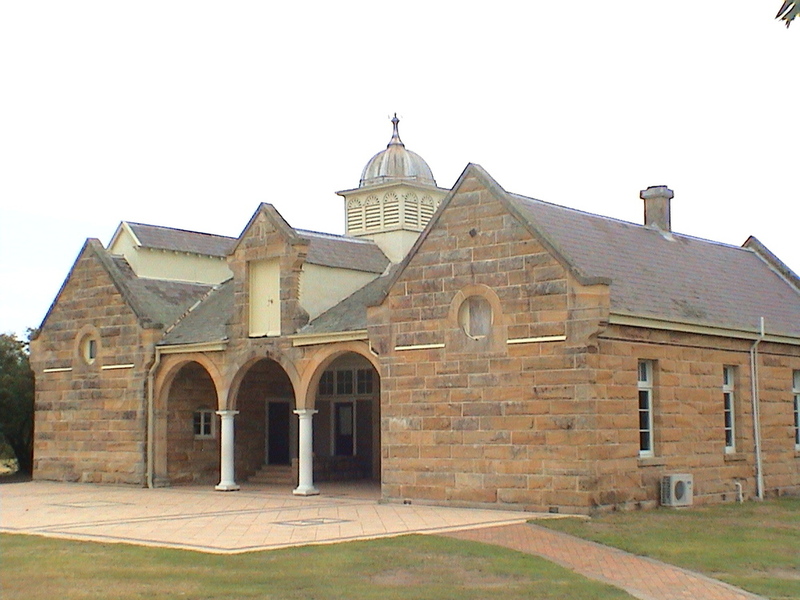 The old sandstone stables (circa 1890) at The Kings School, Parramatta, now used as classrooms has original welsh slates on the roof. Sandstone was also used. 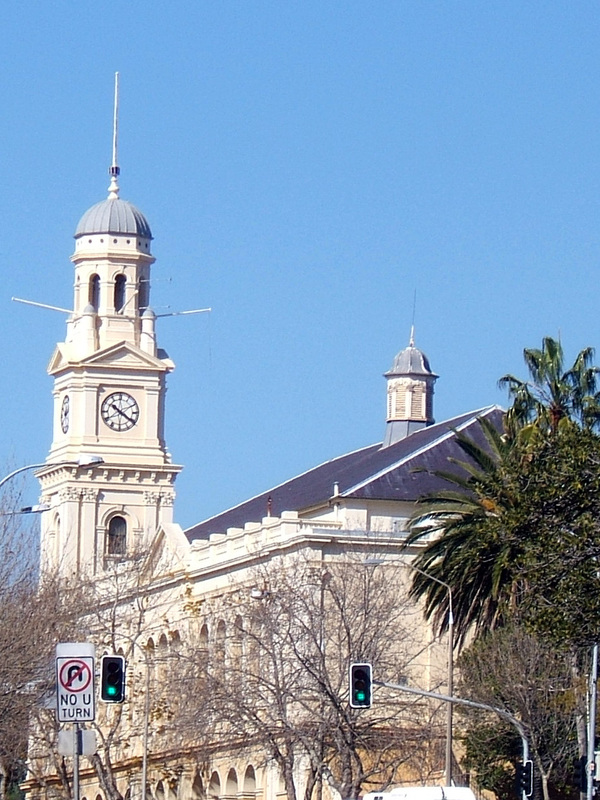 Customs House was built in 1876 on the former convict stockade and designed by architect James Barnet. It has been recently re-roofed in new Welsh slate. Juniper Hall was built by a gin distiller named Robert Cooper in 1824. The oldest standing home in Paddington, it was named Juniper Hall after the juniper berries that are used to make the beverage of the same name. Later the house was used as an orphanage before being renovated and opened as a museum in 1980. In 1984 the community was up in arms over plans to redevelop Juniper Hall as a shopping arcade, and in March of that year the National Trust announced that it would purchase the property. The building is the oldest home in Paddington and a fine example of colonial Georgian architecture and features new Penrhyn slate on its roof. The Welsh slate on the Edmund Blacket designed building at Sydney University is around 140 years old and still performing well. The beautiful sandstone and slate residential block was completed in the 1860s under the watchful eye of architect, Edmund Blacket. The current roof features the original Welsh slate with the exception of some of the repairs that have been made with Welsh slates of a different age and colour. The roof on this building is scheduled to re-slated in the next few years. This beautiful church with its new Welsh Penrhyn slate roof and sandstone block walls lays quaintly nestled amidst some "tall timber" in Railway Square in the heart of Sydney's CBD. This sandstone and slate church was originally designed by Henry Robertson but the building was finished by Edmund Blacket. The foundation stone was laid in 1840 and construction completed in 1845. The original slates lasted nearly 160 years! The white stains running down the roof under the dormer window may have been prevented by treating the lead flashing with patination oil - an explanation of which appears in the Roofing Slate Users Guide. Victoria Barracks was designed by George Barney and built by convicts using Hawkesbury sandstone in 1841 and completed in 1848. The long barracks block is 225m long and was built to accommodate 800 men. 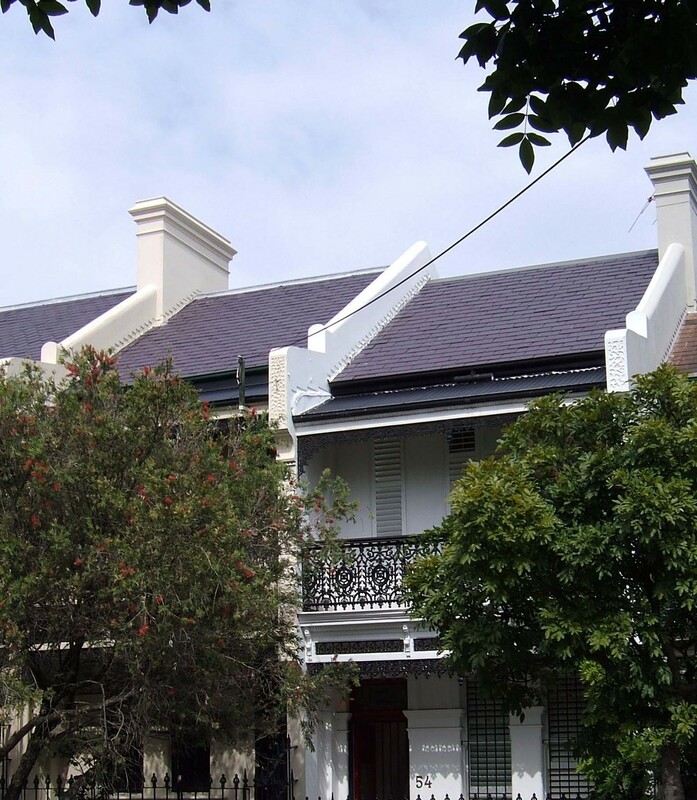 The original Welsh slate roof had repelled storms for over 150 years but couldn't handle the size of the hail and the viciousness of the storm that wreaked havoc in Sydney in 2000. The slate on the roof was replaced with new Penrhyn slates the following year. 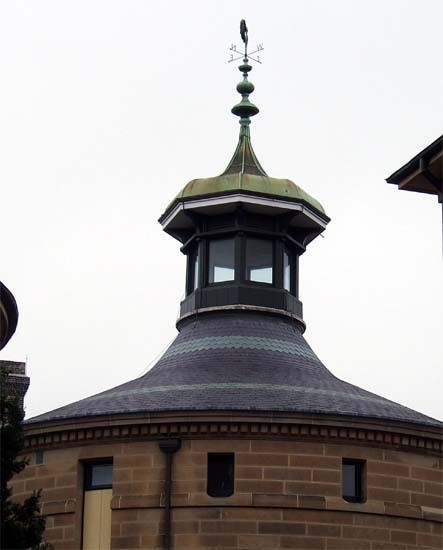 Welsh slate and sandstone were a feature on the beautiful, but disparate collection of buildings on this site which were designed by ex convict, Francis Greenaway for what was originally the Darlinghurst Gaol. Construction on the gaol wall began in 1822, with completion of some of the cell blocks in 1840. The main material used for construction was Sydney sandstone, cut into large blocks by convicts. Convict markings on the blocks are visible along the upper half of the wall on Darlinghurst Road. The site was used as a prison until 1912, when Long Bay Gaol opened for business. During the time it functioned as a prison, 79 prisoners were executed mostly by hanging. Famous inmates included Captain Moonlight and Jimmy Governor – both of whom were hanged on site. Henry Lawson also spent time in the prison for drunkenness and failure to pay alimony; he referred to it as "Starvinghurst Prison". A beautiful manor house in Randwick, Sydney with new Welsh slate on the roof. The blue/purple colour is characteristic of new Welsh Penrhyn slate. Lead is the most commonly used material for ridge capping on slate roofs. New Welsh slate was fixed to the roof after a fire destroyed the old roof in the late 1990s. The use of sandstone, copper and slate blend harmoniously with the grassed forecourt in the main quadrangle of the University of Sydney completed by architect Professor Leslie Wilkinson in the early 1930s. The slate roof on the right has been replaced; the roof on the left is old and patched. The University has an enormous challenge with its restoration work; each year a budget is set for re-roofing many of the old slate roofs on University buildings. The challenge to maintain the sandstone and slate roofing at the University is enormous and work in progress. Each year restoration work is carried out but I am sure the University's architect would like a much bigger budget! "Redleaf" the unique historical building c1863 that forms the central hub of the Woollahra Council Chambers was recently re-roofed with Welsh Penrhyn slate to replace the original slate that after nearly 150 years, had started to deteriorate. The recent restoration to the council chambers with its extensive harbour views, won an Architecture Australia Award in 2002 for conservation. The Penrhyn quarry famous for its Heather Blue slates is still operating after 200 years and is now, the largest roofing slate quarry in the world. It has a projected lifespan of at least another 100 years. The quarry is located near the village of Besthesda in Gywnedd county. The Penrhyn office made almost entirely with slate from the quarry. Sometimes hail storms have damaged roofs on heritage buildings so they have been replaced. In other cases, poor ventilation has allowed moisture to build up in the roof cavity making the slates fret and go soft. Sometimes wooden battens and nails have failed so the roofs have been stripped and new slates have been used instead of replacing the originals. Either way, if you're having difficulty ventilating old roofs then our range of slate line ventilators may help. They are unobtrusive, lie flat on the roof and have a free air capacity of 10000mm2. They have been specially designed for 600x300, 500x250 and 400x300mm format slates. 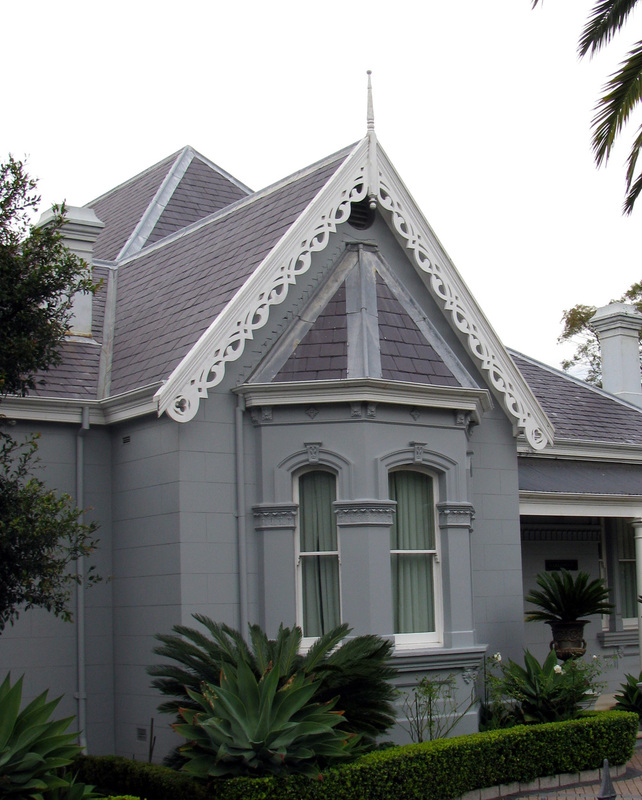 "Welsh slate has been the superior roofing for Australian buildings since it was first brought here in 1829. All our most important historic monuments have slate roofs" - Clive Lucas AO, Senior Partner, Clive Lucas Stapleton Architects, Sydney.